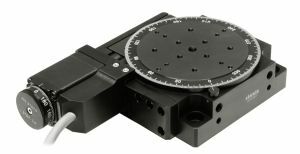 Default choice for ordering motorized translation or rotation stages is with dial knob. 8MT175-100 - translation stage 8MT175-100 with dial knob. 8MR190-2-28 - rotation stage 8MR190-2-28 with dial knob. Revolution sensor counts stepper motor axis revolutions. It consists of Codewheel with one mark and Optointerrupter. When motor is connected to Standa controller 8SMC5-USB, signal from revolution sensor allows monitoring of motor axis revolutions, possible loss of steps and detecting motor stalling. It is not as accurate as encoder, which provides feedback for each step of motor. Revolution sensor determines whether there was any loss of steps within one revolution of motor axis. This information is reported to the controller and corrective actions can be taken. Revolution sensor can also be used for precise home position setting. For ordering motorized stages with revolution sensor, please add symbols E4 to the code of motorized stages. 8MT175-100-E4 - translation stage 8MT175-100 with revolution sensor E4. 8MR190-2-28-E4 - rotation stage 8MR190-2-28 with revolution sensor E4. When damper RD is used, vibrations and motor noise is greatly reduced, settling time is improved and system resonance are suppressed. For ordering motorized stages with damper, please add symbols RD1 to the code of motorized stages. 8MT175-100-RD1 - translation stage 8MT175-100 with damper RD1. 8MR190-2-28-RD1 - rotation stage 8MR190-2-28 with damper RD1. Our 2-channel encoder is compact and lightweight. 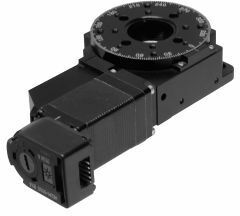 Encoder measures motor axis position change and direction and provides feedback to controller. Encoder type HEDM-5500-B14 with 1000 pulses per revolution is used by default. Standa controller 8SMC5-USB can use signal from the encoder for motion monitoring. Result of the monitoring is high system reliability - controller can detect motor stall situation very quickly. Threshold level of motor stall detection is programmable using program SMCVieW included with controller 8SMC5-USB. User specific software can get feedback from encoder through Standa controller 8SMC5-USB and send motion correction commands back to it using provided software libraries. 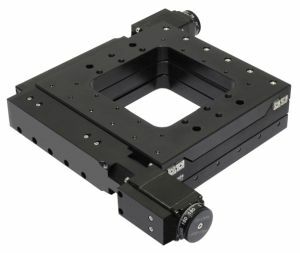 Unlike servo motors, stepper motors do not necessarily require encoders for operation. 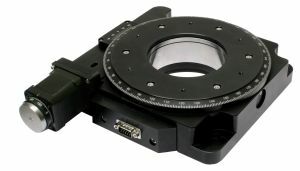 Encoder provides monitoring option. 1000 pulses per revolution ensure precise step monitoring down to 1/4 microstep mode. For ordering motorized stages with encoder, please add symbols MEn1 to the code of motorized stages. 8MT175-100-MEn1 - translation stage 8MT175-100 with encoder MEn1. 8MR190-2-28-MEn1 - rotation stage 8MR190-2-28 with encoder MEn1.